Western Canada has become a second home with many trips to see whales and bears. The good trips involve a bit of flying or sailing. 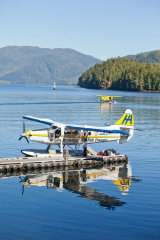 Memorable trips have been to the coastal mountains to see grizzly bears and the Great Bear rain forest to see the rare Spirit Bear (both requiring seaplane and boats). The Spirit Bear was done on foot in very wet conditions (rain forest!) while the Grizzly Bears were from a small aluminium boat in the sedge grass of a river estuary. This allows you to get very close with some safety. Safety is largely down to the guide and his/her knowledge of the individual bears. Touch wood we have had no bad bear experiences but many close (good natured) encounters.